Welcome to The Fotobug Podcast number 125 featuring Tampa based photographer, Jim Sykes. In recent news, the Lytro CEO announced that the company has raised $50 million in funding and plan to make a strategic into video and virtual reality. Jim and Fred discuss the 'viral' blue and black dress (or is it orange and white?) that was posted on Facebook. Also, Haje Jan Kamps announced that the Kickstarter project for the Ada device has been cancelled due to higher than expected manufacturing costs. The current software and PCB circuit board information will be released as open source on Github. British photographer Martin Le-May captures an amazing image of a weasel riding on the back of a European Green woodpecker. Finally, The FAA releases new guidelines for UAV pilots which will be covered in more depth in a future episode. Our guest this episode is photographer Jim Skyes (www.jrsphotos.com). Jim specializes in architectural and luxury home photography as well as portrait photography, photo tours and is also the president of The Tampa Bay Photo Club. Jim and Fred join Mr. Sykes in his Ybor studio and discuss his trips, photography tips and more. Jim is also is a member of the Ybor Art Association, The Tampa Bay Strobist and Photoshop Collective, and numerous other photography organizations in the Tampa Bay Area. 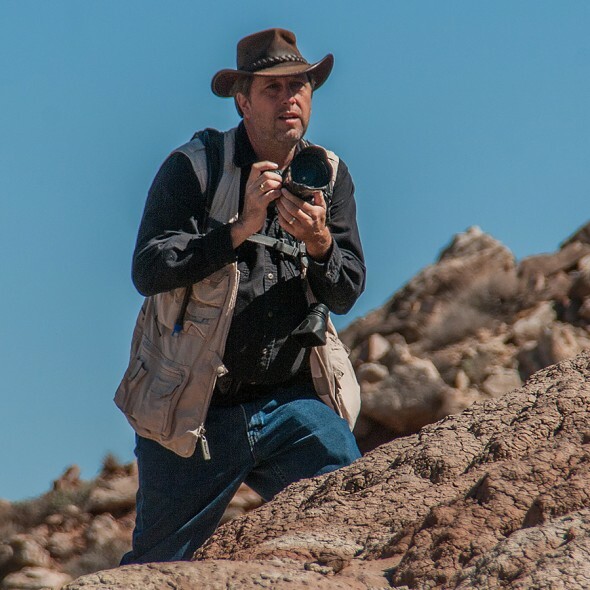 We urge you to check out his gallery at his website and check out his New Mexico photo tours. Jim is one of those rare photographers who are still shooting film on occasion! Don't forget the Tampa Bay Photo Shootout coming up April 10, 11, and 12th (www.thephotoshootout.com) and additional workshops this summer (www.outdoorphotoworkshops.com). In addition, our previous guest, Vanelli, has arranged a photo workshop cruise at (www.vanelliandfriends.com/cruise) featuring Vanelli, Vincent Versace, and Mike Moats. (Fotobug Jim will be there as well! ).